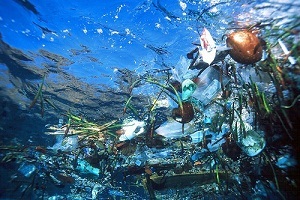 “Yes,” Says Research, Fish Consume Plastic Debris – Neptune 911! Editor’s Note: This report from Phys.org digs deeper into what happens to the gyre-trapped plastic debris in the Pacific Ocean–the night feeding fish are consuming the debris. An abundant organism may be acting as a sink for the smallest plastic particles which make up the majority of the ocean’s plastic load. UWA Oceans Institute director Carlos Duarte, along with UWA PhD student Julia Reiser, has been surveying the ocean to uncover the distribution of plastic across the world. Professor Duarte presented the findings in a public lecture as part of the UWA Inquiring Minds series, showing for the first time a global picture of plastic concentrations in the ocean. “Even though there’s been reports of high loads of plastics in particular regions of the ocean, until now we didn’t have a really good survey,” Prof Duarte said. The researchers’ modelling indicated plastic debris should accumulate in central gyres of the ocean – areas of stagnant water unaffected by currents around coastal areas – but only one, in the Pacific Ocean, had previously been sampled. “In that gyre, there’s a high amount of plastic debris, but we don’t really know whether this is true for the other four gyres in the ocean—two in the Pacific, one in the northern and one in the southern hemisphere, two in the Atlantic, and only one in the Indian ocean,” Prof Duarte said. To build a global picture, the Oceans Institute used Neuston samplers, similar to small catamarans, to skim the top 10cm of the ocean and collect samples containing small buoyant plastic particles in collaboration with Ms Reiser surveying the Australian coast, and colleagues in Chile. The particle concentration in the gyres was 100 to 1000 times greater than in the rest of the ocean. However, the sampling came up with a “surprisingly small” estimate of the particle debris in the entire ocean. “We were expecting values in excess of one million tonnes of plastic, and only found between 10 and 30,000 tonnes of plastic,” Prof Duarte said. Prof Duarte said the pathways of loss included particles breaking into smaller and smaller pieces due to UV radiation, degradation by bacteria, and abundant organisms called myctophids, or lanternfish, acting as a sink for the particles.